Recognising the need of the hour as the Northern Province was heavily affected by floods, Naturub Group of Companies, a leading manufacturer and exporter of apparel accessories and trims in South Asia, recently launched a successful CSR project as ‘Friendly Help’ which donated dry rations worth Rs. 1.6 million to the flood-affected friends in the north. 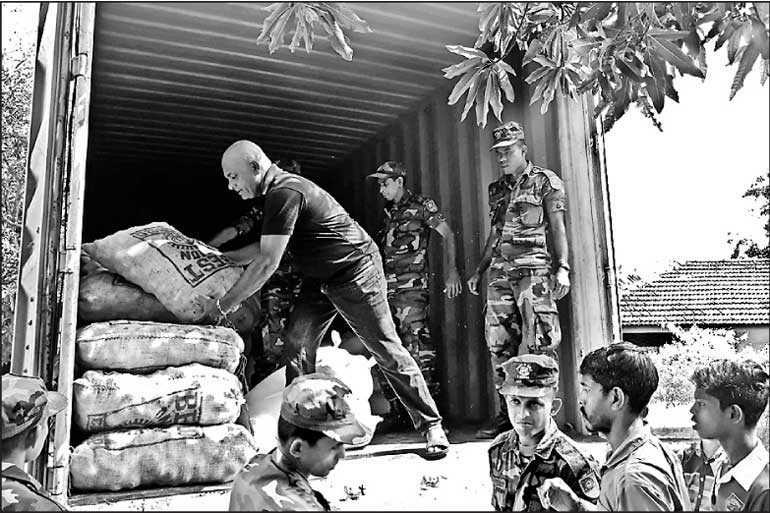 At the relief camps located in Kilinochchi and Mullaitivu Districts, namely Pannakkarandi Vidyalaya, Murusamoddai Vidyalaya, Shivanagar Vidyalaya and Punagar Vidyalaya, 5,000 kg samba rice, 1000 kg dhal, 500 kg sprats, 500 kg B-onions, canned fish, chilies, tea, coffee, sugar, biscuits and Panadol were distributed proportionately and were much appreciated by the flood-affected recipients. Around 1,500 persons were benefitted from the ‘Friendly Help’ CSR project. Naturub Group of Companies greatly appreciated the fullest support extended by Major General Shavendra Silva, Chief of Staff SL Army, Col. Rohan Rajapaksha, and all other officers and men of the Gajaba Regiment by organising and coordinating this whole event very successfully. It is praiseworthy that the company fully funded the entire project and distributed dry rations in the northern flood-affected areas.